We haven't come across a Reveen cooler before, but that's hardly surprising as it's a pretty new company on the scene. The current flagship of its tower designs is this Kelveros RC-1202. It's a direct contact design, using two sizes of heat pipes and supporting all the usual socket types, even the ancient LGA 775 last seen on an episode of Time Team. 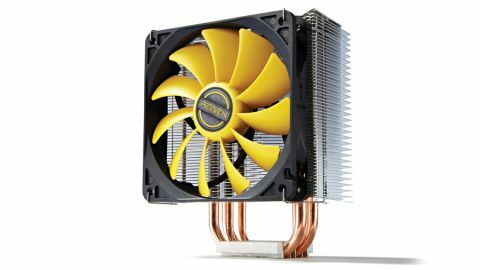 The Kelveros RC-1202 stands out from the crowd with its 60-finned cooling array. It almost looks like you could shine a searchlight through it to enlist the help of a certain caped crusader. Cooling this array down is one of Reeven's own 120mm Coldwing12 PWM fans and attached to the cooler is a simple two-way fan controller built into a PCI bracket. That allows for either low speed (650-1,300rpm) and quiet performance, or high speed (650-1,900rpm) and increased cooling, although during our overclocked testing the fan had no impact on the temperature of the CPU. There's a 37mm gap under the cooling fan, and with the cooling matrix/fan projecting over the first DIMM slot, this gives you just enough room for a standard height memory module. If you're using RAM with tall heatsinks, such as the Kingston Beast, then you'll have to leave this slot empty if you use the RC-1202. Reeven uses something it calls HDCS (Heat pipe Direct Contact Solution) technology for the Kelveros. This is just a fancy name for a direct contact based cooler - one where the heat pipes pass under the cooler and are ground flat to allow direct contact with the top of the CPU. Strangely, Reeven has decided that the four copper pipes shouldn't be the same diameter; instead you get two 6mm and two 8mm pipes. Installation presented no real problems, apart from one of the mounting bracket screws having slipped through quality control. The thread wasn't cut fully. The bracket was secure enough without it and it takes a bit of juggling about with the mobo to get it installed, but the instructions were clear and the cooler was on the motherboard within 20 minutes of opening the box. To stress test it we ran Prime 95's small FFTs test for 20 minutes to get the CPU running at 100 per cent, using Real Temp to take an average of the four cores. Then, to really put the cooler through the mill, we over clocked the Core i7 to 4.5GHz and re-ran all the tests. At idle the RC-1202 coped pretty well keeping the CPU at 31C. However, when we pushed the CPU to 100 per cent, the cooler gave up. The temperature of the cores shot over 100C in less than a minute, so we terminated the test. It's a shame that Reeven's top-end coolers aren't able to cope with the rigours of an overclocked i7, but the performance was still decent at stock speeds. With overclocking a niche activity that may not be such a problem for a £36 cooler, but it does limit your options. The Kelveros isn't a bad debut for Reeven, but there are better alternatives.